Candida albicans, commonly known as candida, is a type of yeast present mainly in your digestive tract. Candida belongs to a group of cells called eukaryotic cells whose main functions include metabolism and energy conversion. Normally, your immune and digestive systems keep candida from reproducing too rapidly, migrating through intestinal walls and invading body tissues. However, outside factors such as a poor diet, stress or certain medications can interfere with control measures, allowing candida to proliferate. A candida diet that places severe restrictions on food consumption is one way to eliminate excess candida and restore balance. Candida cells may thrive if you consume high amounts of sugar. The purpose of a candida diet is to remove this food source from your diet and starve candida yeast cells. Reduce processed grain consumption and eliminate simple carbohydrates that quickly convert to sugar during digestion. Another approach is to follow a diet that raises the pH in your body by choosing high alkaline foods. Although rolled and quick-cooking or instant oatmeal is a processed grain as well as a very low alkaline food, there is variation as to whether it is on a list of foods to avoid. For example, some health practitioners may recommend you you consume no grain products at all, while DisabledWorld.com recommends eliminating only the highly processed quick-cooking or instant type of oatmeal. Holistic health counselor Cynthia Perkins provides a possible explanation for the variation in oatmeal recommendations. Perkins states that not only is oatmeal high in carbohydrates, but also disrupts your gastrointestinal tract because as your body finds it difficult to digest. In addition, says Perkins, many people are allergic to oatmeal. Perkins recommends that you either eliminate oatmeal or eat it only occasionally. If you want to include oatmeal in your candida diet, naturopathic physician Dr. Jeff Clark of True Health Medicine PC in Tualatin, Ore., has an alternate solution. Clark recommends that you replace processed oatmeal with unprocessed, raw oats. Raw oats are essentially sprouting seeds, says Clark, as they still contain the inner seed kernel. Although Clark notes that more research into the effectiveness of eating raw oats is necessary, it appears raw oats become food for the beneficial microflora that help keep candida under control. You soak and blend raw oats rather than cook them when making raw-oat oatmeal. To prepare, soak one cup of raw oats in a cup of water for a minimum of two hours, or overnight if you plan to have them for breakfast. Blend on high in a food processor or blender and pour in a bowl. If you want to add a flavoring, Clark recommends cinnamon or another spice or seasoning, except for sugar. 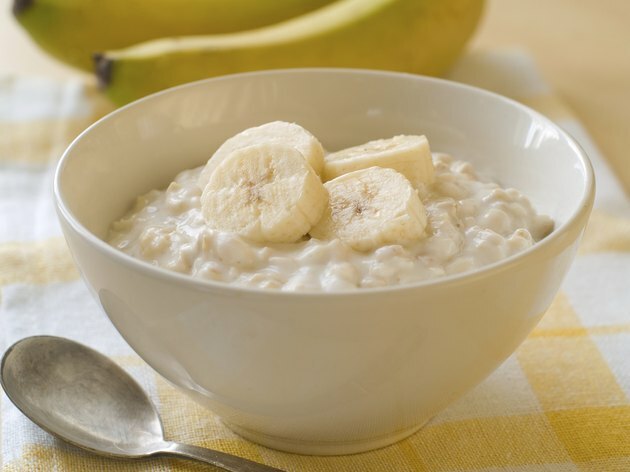 Talk to your doctor before including oatmeal in your candida diet. She may or may not recommend including oatmeal, based on the severity of your condition and any food allergies or other conditions that you may have. Are Rolled Oats the Same as Oatmeal Cereal?